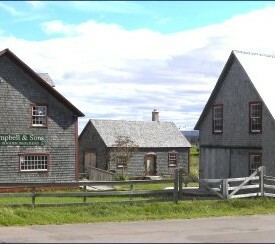 Experts from King’s Landing Historical Settlement have confirmed that the Campbell Carriage Factory in Middle Sackville, built in 1838, is one of the best existing examples of a 19th century industrial site in Eastern North America For over a century (1838-1949) the Factory was an important part of the local economy and it is significant enough to be designated as both a provincial and a national historic site. With the retiral in 1949 of the last two elderly employees the factory was locked up and all its contents left undisturbed. For almost half a century the building with its treasure trove of materials and machinery lay hidden from sight. It was with great enthusiasm that in 1998 the Board of the Tantramar Heritage Trust took on a major restoration of the carriage factory site focussing on “the horse era of Tantramar.” Some 6000 objects discovered within the building formed the basis for the contents of the museum. Continuing restoration work and further enhancements of the property in 2008 and 2012 have ensured that this historically significant site is preserved for future generations and is available to the public as a museum of unique interest and importance.